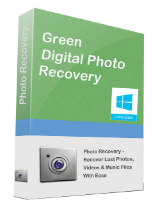 Green Digital Photo Recovery, is the professional Photo Recovery Software which enables you to recover deleted photos, music, video files, etc. from digital cameras, memory cards, external storage, USB sticks, and even from hard drives. The program displays images and files that it finds and allows you to recover all of them. The program is easy to pause or restart photo recovery during the scan process according to your schedule. Save the previous scan results and import it to resume recovery without scanning once more. The file name, size and date filter help you find specific files quickly to save you time. Green Data Recovery, an international leading software company in data recovery for your Windows, Mac, iPhone, iPad, Hard Drive, SD Card and so on. We rescued millions of computers and servers worldwide to make easy digital life. Over 10,000,000 wonderful users around the world. We protect digital life for home users, businesses, enterprises, organizations, technicians and service providers. Professional data backup and security solutions come across over 160 countries and regions with strong language support. We offer first-rate technical service including email support,online help and technical forum to solve users' problem in time. Check our Product Lines here: http://best-datarecovery.com/products.html 2018 Green Data Recovery Studio. Current time: 04-19-2019 , 01:42 AM Powered By MyBB, © 2002-2019 MyBB Group.